BERU morning dawned grey, wet, blowing and with passing thunderstorms. It soon became apparent that the 18m spiderpole supporting the 80m GP had ceased to exist at some point during the night, having broken into 3 pieces and taken with it the 10/15/20/40m dipole which I had rigged between it and another 18m, which hosted an elevated 40m GP. The guy support sleeve on this second mast had slipped down by several feet, leaving it in a most precarious attitude. A third 12m mast, which carried a 3-band 20/15/10m GP was more or less intact, although all the guys had stretched a fair amount. At this point, some of my wifes less optimistic predictions for the trip seemed likely to come to pass and my mind turned to the earlier thought processes that led us to embark on it.. 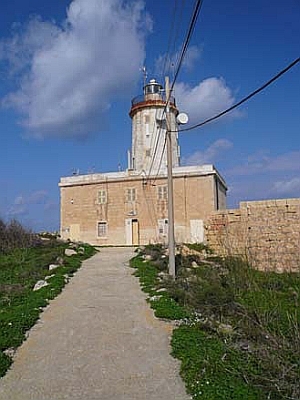 The idea of BERU from Gozo was born during a holiday visit to the island with my wife Gerry last year, when I had spotted some likely locations during our exploration of the island. We spent a day checking some of these out in more detail. The lighthouse looked good from a distance but there seemed to be a lot of electrical activity and access for the last 500m was only on foot. Another superb site found on Google Maps turned out to be a major pilgrimage venue! We also looked at a penthouse apartment near Marsalforn, which had an excellent outlook and good roof space but rather a lot of neighbours. 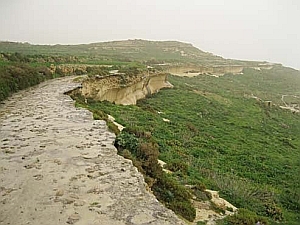 Finally, we had managed to reach the uninhabited NW corner of Gozo via a narrow, unprotected and in places overhanging cliff-top track. The area was used for agriculture and hunting and there were some open areas which looked possible. Take-off to the UK, VE, VK/ZL (LP), the Caribbean and Africa was just about perfect. The nearest habitation or other infrastructure was several miles away and so the site was beautifully quiet. After our return, further consideration (and discussion!) ensued. This would be my first radio event outside the UK for nearly 50 years, so was it really practical? Looking at past results, good ionization levels are essential to do well in BERU from the Med area and 2012 looked promising. 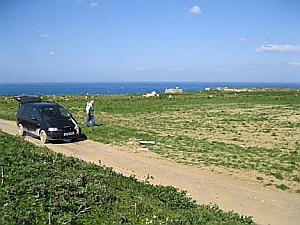 A green field effort was going to need masts and a genny which were unlikely to be welcomed by Air Malta, let alone their competition! The family Alhambra MPV was over 10 years old; would it survive a 2500 mile return journey. More importantly, did it have enough ground clearance to reach the earmarked site? Only one way to answer these for sure! 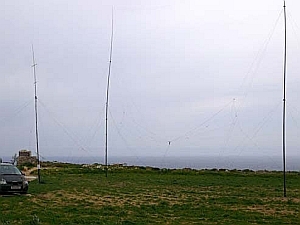 Having decided to bite the bullet and that the combination of a quiet site and vertical antennas were likely to be the keys to a reasonable showing in the restricted section of BERU, 3 Spiderpoles (2 x 18m and 1 x 12m) had been shoe-horned into the back of our MPV, along with pre-cut lengths of coax, an operating shelf and chair, K3/100, our 3KVA diesel genny, an old BNOS 12v 25A PSU and an even older home-built spare. 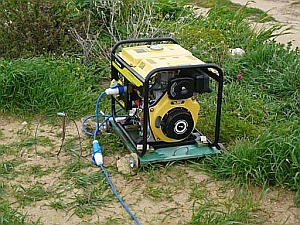 We have lived at the end of a long and often unreliable overhead power feed for nearly 20 years but this generator was a fairly recent acquisition, having suffered a variety of problems with petrol machines. My wife and I had driven down, taking the ferry from Genoa to Palermo and arriving in Gozo with a few days to spare, all in all a most enjoyable trip, to be recommended. We took the most direct route, through Belgium, Germany and Switzerland, transiting the Alps via the Gotthard tunnel which is free, open throughout the year and has excellent road access both sides. Weather in Gozo during the week prior to BERU had been fine until the Thursday night when the wind had started to get up. Installation had taken a couple of days but the 3 masts had gone up without mishap. Back to BERU morning, what could be salvaged from the carnage? During our survey visit, the field I had provisionally selected had been more or less firm underfoot, however 120mm of rain on the Friday had rendered it almost impassable on foot and certainly by any sort of vehicle. Bearing in mind the dire forecast, I had sourced some planks locally so the vehicle could stand off the track and within cable range of the antennas. These were switched from the K3 by a 6-pack of relays, installed on the 12m mast below the GPs. So something had worked and the time taken to waterproof the relay box now appeared well spent! First on the list was to salvage the 40m GP, which was in imminent danger of collapse. Lack of proper lower guys left the mast in an S-shaped attitude for much of the time, but at least I could get the overall shape to approach vertical. The 80m GP mast was still standing to the first guy level and so I arranged the top section of the radiator around the remaining guys as high as I could reach. A quick check with the RigExpert AA 54 showed a reasonable match, so 80m might not be complete write off. 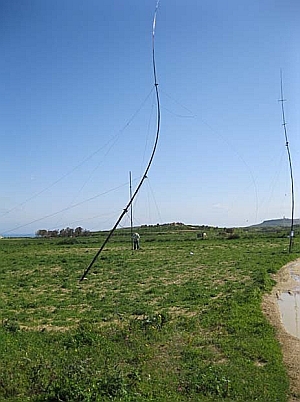 The 20/15/10m vertical was undamaged, however the dipole, which had been intended to provide some higher angle radiation for the UK when needed, now lay half-buried in the mud. Now for the genny, which had also been out in the elements for two horrendous nights, to allow sleeping space in the car. Wow, first turnover, my faith in Chinese engineering has been justified! The other stars of the piece were the screw-in guy anchors, designed for soft ground and certainly getting it. None of them had moved more than a few mm, despite more guy load than I could hold during the peak of the gales. Half a dozen QSOs and we were in business, a full half hour before the start. And then, as if by magic, the wind dropped and the rain abated! Still gusty, but I would be able to refill the genny without having to change into wet gear. As it turned out, less than the 12 litre tank capacity was actually consumed and so I could have been spared the trouble. Being otherwise engaged during the week up to BERU, I had heard nothing of solar disturbances and so everything was looking good, with plenty of stuff coming through. I started off on 20, thinking it might be a tad early on the higher bands for the UK and confidence started to build. Moves to 15 and then 10m also looked good. My strategy, if you can call it that, was to run for a bit and search for a bit once things quietened down on the run frequency. I�d been keeping an ear open for Nigel in ZD7 and our numbers fluctuated back and forth in a most interesting manner! I was glad that Peter G3PHO and I had chosen opposite sides of the island for our respective operations and that we were cross-polarised (Peter was using dipoles). We were accordingly able to work easily within a few hundred Hz of one another. Finally, the time came when it would be necessary to try out the jury-rigged 80m antenna. I could just about hold a run to the UK, but calling anyone where there was other interest was notably unsuccessful. There was a manual option on the antenna selection relay pack and so I could still access the (buried) 4 band dipole and the 40m GP – the latter seemed to perform better than anything else, despite the VSWR. Then I got a call out of the blue from Nigel, who was quite weak himself at the time. Wow that mans something else! Suddenly things were looking better and I even resorted to a bit of tail-ending when calling in pile-ups (just in case the guy needed the 9H bonus, I told myself!). Not at all the done thing in BERU I know, but these were desperate times! A lot of stuff still got away and in the end I probably did not spend as much time on 80m as I should . 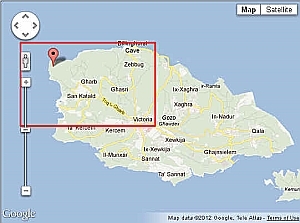 . .
Against my usual practice, I kept a laptop running alongside the rig, displaying a real-time great circle map (AZMap) centred on Gozo, showing the delineator. Logging was still done by hand as usual, as (for me at least) it is quicker, more satisfying and I can respond to callers instantly. However this real-time map was really useful in selecting potentially useful band opportunities, including the quite amazing long path opening to VK/ZL on 20m, which started at 0250 and continued for more than an hour at full bore. There is rarely enough activity from that area to keep up a run for long of course, but it was very rewarding to be able to winkle out some of the less well equipped players. I suspect the Jubilee Prize Draw was responsible for attracting more UK activity than I was expecting and as time wore on, my stock of pre printed patent log sheets, which went up to QSO No 960, started to look rather thin. More than enough for a restricted entry, I had thought, looking back through past results . . . In the end, the backs of the largely unused dupe sheets were forced into service to log the last 150 QSOs. Not pretty, but I think they only gave rise to one mistake, recording (but luckily not sending!) the same number for the last two QSOs. In the final knockings, I had nearly caught up with Nigels numbers, but hello, what is this ZF1 all about? He clearly has a good station as he had heard me well on 80m and his numbers are going up in the most alarming way! Very well done that man! After the event, I left the masts standing and drove back to Marsalforn, returning the following day, when the weather had brightened up a lot. It was then I learned just how good those guy anchors were, but the site was still waterlogged and recovering everything and getting it all packed away in the MPV was quite a mucky job. That evening, Gerry and I had a most enjoyable meal with Peter G3PHO and his wife and friend, at which the usual post mortem was held! I learned then of Peter’s problems with the extreme and most unusual weather, which gave rise to significant loss of time for him. Peters photo of this event is included in his own report on BERU 2012. So, would I do it again, often wet, cold, uncomfortable and seriously lacking in sleep? Watch this space! Lots of lessons learned though, including the desirability of doubling up on manufacturers guy size recommendations!